Organizer Kyle Ashby addresses the first Startup Weekend crowd in June. Thanks to the global reach of the Internet and DIY-enabling power of modern technology, there’s probably never been a better time to be a creative-minded entrepreneur. 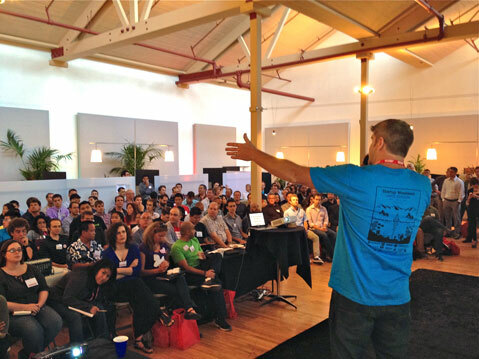 And thanks to the new series of Startup Weekends that foster business ideas into reality, there’s probably never been a better time to be such an entrepreneur in Santa Barbara either. 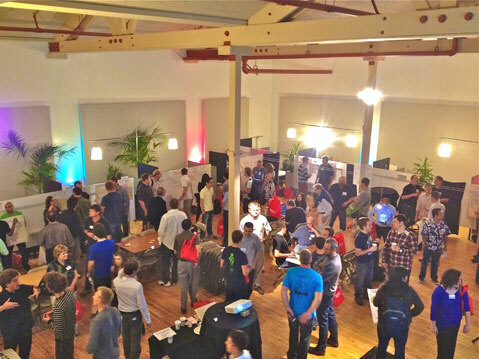 A scene from Santa Barbara's first Startup Weekend last June. Employing a model used globally, Startup Santa Barbara — which is happening at Citrix in the heart of Goleta’s high-tech ‘hood — begins Friday night at 6 p.m., with the pitch session commencing after dinner. There, all participants will get a chance to sell their idea. The best ideas are chosen by the crowd, and then teams form around what’s needed to make them into functioning apps, programs, or products by the end of the weekend. From Saturday morning ‘til Sunday afternoon, teams work around the clock to get it done, with the help of mentors, and then present the finished product to a panel of judges on Sunday afternoon. Along the way, the public is invited to check out the pitch session, the Saturday seminar at noon, and the Sunday finals and judging starting at 5 p.m.
Want to get involved? Visit startupweekendsb.com to sign up.